Learn about colour management, software and printer settings for optimal screen-to-print matching, and more with free digital resources from EIZO. To properly manage colour in your work, it is necessary to ensure your monitor maintains consistent settings. The bundled ColorNavigator 6 software allows you to easily carry out calibration. Simply select the desired preset or assign values for brightness, white point, and gamma. The built-in sensor directly utilizes the monitor's look-up-table and creates an ICC profile within minutes. 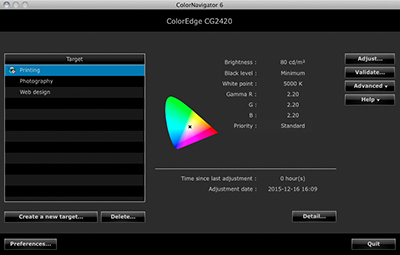 The ColorEdge CG2420 supports ColorNavigator NX quality control (QC) software. It offers asset management of client ColorEdge monitors and covers calibration, emulation, built-in sensor correlation, and color mode settings. 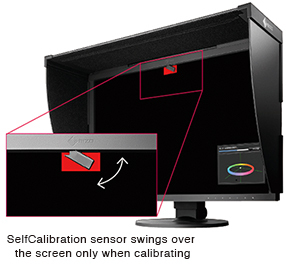 With ColorNavigator NX, calibration information is saved to the monitor instead of the PC's operating system so you do not have to recalibrate if connecting to more than one PC. The software is most effectively used with EIZO's ColorNavigator Network solution. ColorNavigator Network provides centralized quality control of ColorEdge monitors that have ColorNavigator NX installed. Administrators can set colour modes, schedule self-calibration, register or adjust asset management settings, and other tasks whether the monitors are local or remote. ColorNavigator Network is hosted on a secure cloud server to free you from the initial investment and running costs of providing your own server. ColorNavigator 6 emulates the colour characteristics of other media devices such as tablets, smartphones, notebook PCs, and other LCD/CRT monitors. With a spectophotometer, ColorNavigator 6 reads the emulated device's colour patches as they appear in the web browser and creates an ICC profile. By using this profile with a ColorEdge CG monitor, content creators can see how their clients view colour on their respective devices. The wide colour gamut of the ColorEdge CG2420 reproduces almost the entire Adobe RGB colour space so images shot in Adobe RGB will be displayed correctly. Photos of vibrant blue skies and lush green forests are reproduced faithfully in a way that monitors limited to an sRGB colour space cannot display. The wide colour gamut also ensures reproduction of almost the entire ISO-coated and US web-coated CMYK colour spaces used in printing. Using the DisplayPort or HDMI inputs, the ColorEdge CG2420 offers 10-bit simultaneous display* from a 16-bit look-up-table (LUT) which means it can show more than one billion colours simultaneously. This is 64 times more colours than you get with 8-bit display, resulting in smooth colour gradations and reduced Delta-E between two adjacent colours. The gamma level for each ColorEdge monitor is adjusted at the factory by measuring the R, G, and B gamma values from 0 - 255, then using the monitor's 16-bit look-up-table (LUT) to select the 256 most appropriate tones and achieve the desired value. This ensures the smoothest colour gradations in your images. A typical monitor takes 30 minutes or more for its brightness, chromaticity, and tone characteristics to stabilize. 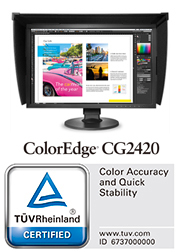 The ColorEdge CG2420 takes a mere 3 minutes. Whether you are working in a studio or taking the monitor with you on location, you get reliable colour display soon after turning the monitor on. Fluctuations in brightness and chromaticity on different parts of the screen are a common trait of LCD monitors. To counteract this, the ColorEdge CG2420 is equipped with EIZO's patented digital uniformity equalizer (DUE) technology to ensure a Delta-E difference of 3 or less across the screen. DUE also counterbalances the influences that a fluctuating temperature may have on colour temperature and brightness for stable image display. The 178° wide viewing angles afforded by the IPS panel technology allow two or more people to view the screen at once with little change in colour or contrast. In compliance with the DCI standard, the ColorEdge CG2420 offers a high contrast ratio of 1500:1 for producing true blacks that are otherwise difficult to display on a typical LCD monitor. When viewing the screen from an angle in a dimly lit room, dark tones typically appear washed out due to the display characteristics of LCD backlights. The CG Series is equipped with a film which allows tones to retain their depth even when viewed from an angle. 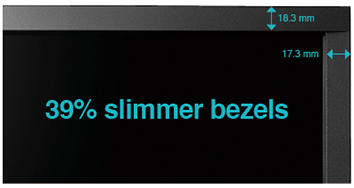 The slim cabinet features unobtrusive frames that are 39% slimmer than its predecessor's so you can focus more on the screen. A carrying handle on the back of the monitor allows you to easily move it from one location to another. The HDMI input of the ColorEdge CG2420 supports I/P (interlace/progressive) conversion for converting the interlace signals from TV and video into progressive signals for flicker-free display. The CG Series comes bundled with a shading hood that effectively prevents glare on the monitor's screen caused by ambient lighting. The ColorEdge CG2420's shading hood is newly designed and attaches to the monitor magnetically. This allows the users to attach the hood quickly and easily without needing to connect separate parts. Adjust the screen to the most comfortable angle and reposition it to show your work to a colleague or client. The monitor comes with a versatile stand that offers height, tilt, and swivel adjustments as well as portrait display. DisplayPort, HDMI, and DVI-D inputs are included and support various types of graphics boards. The HDMI input also offers direct connection with digital cameras. 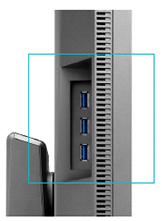 Two USB upstream ports allow two computers to be connected at once so it is not necessary to reconnect the USB cable when using the ColorNavigator software and switching between computers. ColorEdge monitors are backed by a manufacturer's 5-year warranty that covers all components including the LCD panel*. 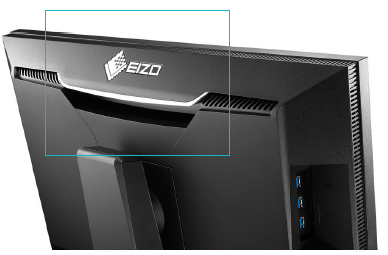 EIZO manufactures its products at its own factories to allow close control over production quality and ensure each monitor is built to last. *Usage time is limited to 30,000 hours. EIZO guarantees its ColorEdge monitors will be free from bright sub-pixels for six months from the date of purchase. The brightness and colour of the ColorEdge CG2420 is warranted for up to 10,000 hours* from the date of purchase. Monitor must be used within the recommended brightness of 120 cd/m2 or less and the colour temperature between 5000 - 6500 K.
The ColorEdge CG2420 was among the first monitors in the world to obtain TÜV Rheinland’s colour Accuracy (Quick Stability grade) certification. 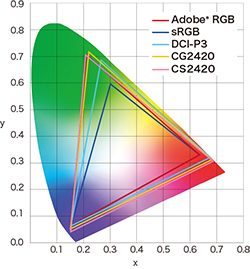 TÜV Rheinland Colour Accuracy is the first quality and performance criterion to measure the colour accuracy of display devices for multiple graphics fields such as photography, post production, design, and printing.